It's September, in fact, it's almost mid-September. Crazy. It's time to start thinking about outerwear. Now I don't need to you to break out your pea coats or scarves. 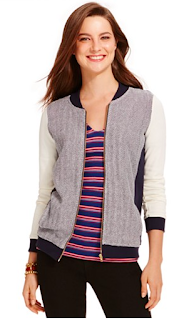 I'm talking about the layering jacket that you can throw on and go. A lightweight but extra something that keeps you cozy through fall. Today we're looking at a lightweight bomber jacket. A beautiful texture and oh so comfy. Fancy a pattern? How about this punchy blue? Oh I love this color. 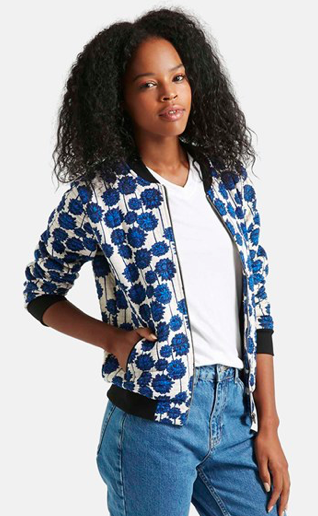 So gorgeous and the waffle print makes it casual. 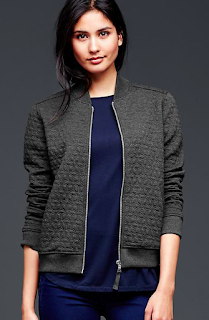 I really like the mix of athletic and tweed in this jacket. Try these jackets for the cooler evenings instead of your standard fleece. It's got some casual structure and you can add your own style by layering with a striped tee or a floral cotton scarf.